"If things seem under control, you are just not going fast enough." 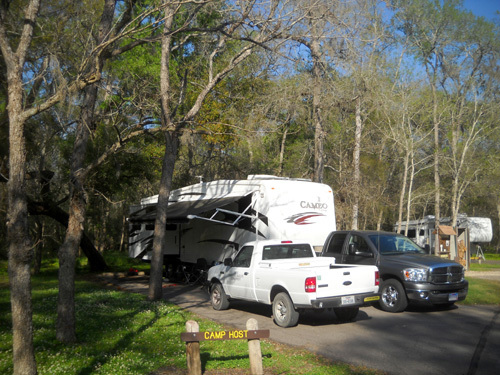 It was a little sad when we pulled out of our lovely campsite at Brazos Bend State Park south of Houston on the first day of spring, March 20. We really enjoyed spending six weeks at the park and wished we could stay longer. I'll explain why we left early in the next entry. The staff is used to campground hosts leaving earlier than originally planned, however. Retirees often have medical and family issues that arise. We've seen that happen with several other couples this year and last. We were on patrol again that weekend at the end of Spring Break. We did our last campground and shelter round at 9 AM, said our good-byes at the park office, and handed off the park truck to the host who was doing the next weekday patrol shift. He was willing to do our noon run for us so we could hit the road. Here's a recap of our trip back to Virginia. 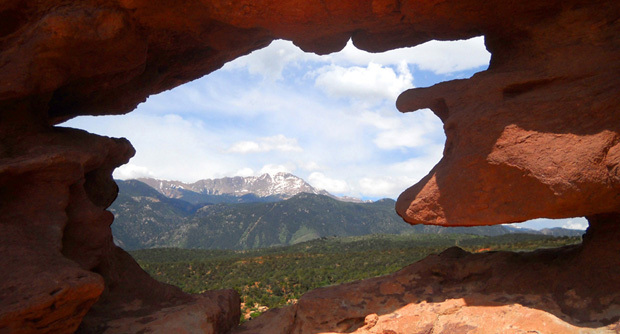 I include our travel information mostly for the benefit of other RVers who read this journal. Some of the information is useful for anyone driving these roads. If you're not interested in all that, just check out the photos or scroll to the end of this entry to see some final stats for our winter trip. 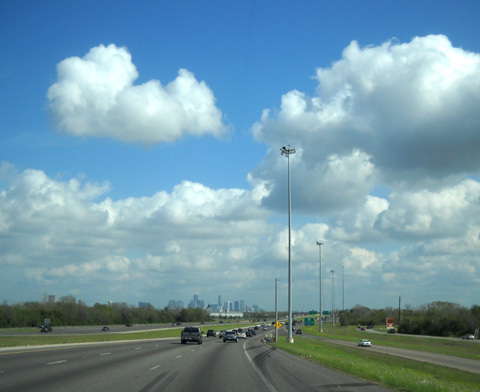 We were a little surprised by how heavy traffic was on a Sunday, even after we'd left the Houston metro area heading east. 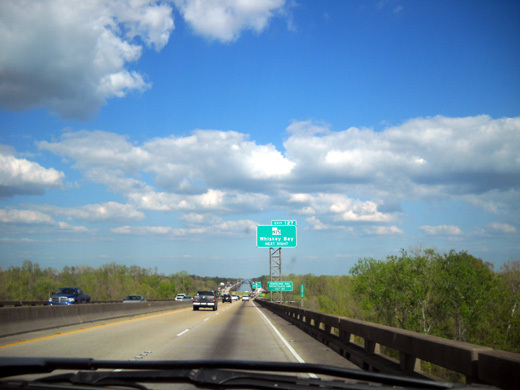 Traffic looked even heavier on the other side of I-10, i.e., traffic heading west toward Houston from Louisiana. 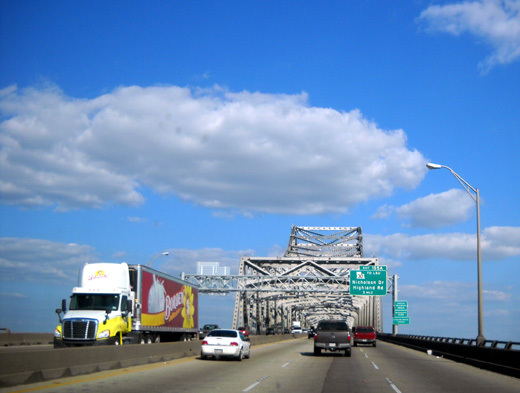 Despite the volume of traffic and several construction zones in both Texas and Louisiana, traffic moved pretty much at normal speed. We kept our speed at 60-62 MPH and didn't seem to impede traffic anywhere. 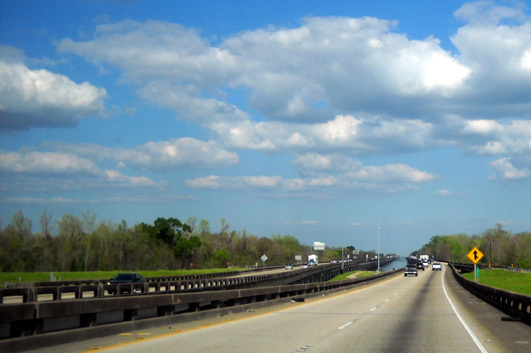 The road surfaces were mostly smooth through Texas but I-10 remains bumpy for about 20 miles east of Lafayette, LA and several other places farther east in Baton Rouge and I-55 north. We were super conscious of all the litter along the freeways that day, after picking up trash at Brazos Bend for the last six weeks! I remember that phenomenon last year, too. The "Don't Mess With Texas" anti-litter campaign doesn't seem to be very effective . . .
Louisiana was just as trashed. The rest area on I-10 at MM 837 in Texas was closed. That's the only one we noticed was closed that day. There is a very nice rest area and visitor center on I-10 at exit 121 in the Henderson Swamp area in Louisiana. There is a large Camping World store with numerous RVs for sale at exit 35 on I-12 west of Hammond, LA; we stopped there last year but not this time. We've been tempted to stop at a large Bass Pro Shop on I-12 at exit 18 (I think) but never have. The prices we saw were generally lower in Texas than Louisiana, ranging from $3.34/gallon in Beaumont, TX to $3.89 in Louisiana. We got fuel twice that day. Our first stop was at an Exxon in Vidor, TX at exit 862 on I-10, where we paid $3.69/gallon. We should have stopped in Beaumont! 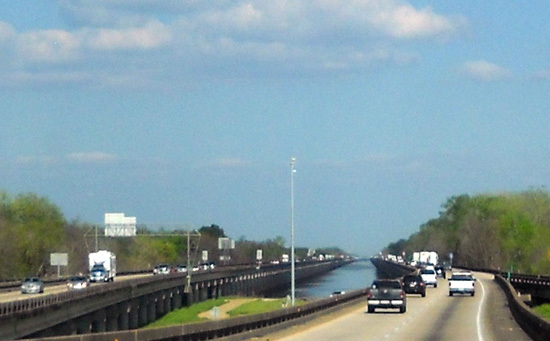 I-10 is elevated over the water for about 20+ miles through the Henderson Swamp. We also got diesel at the Walmart (Murphy) station where we stayed overnight in Hammond, LA for $3.66/gallon using a WM shopping card to get 3� off per gallon. 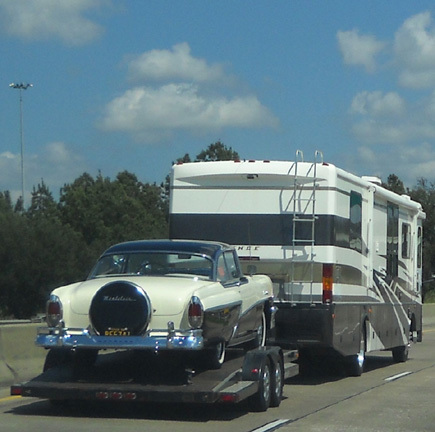 We saw several WM/Murphys along I-10, I-12, and I-55 that day. Their prices are generally the lowest in each area, even lower than at truck stops like Flying J. Our fuel mileage was higher than usual, about 12� MPG. It's usually better going eastbound than westbound because of prevailing winds. We stayed at relatively low elevations all day and didn't have many hills. What a beautiful day and time of year to travel through this area! Temperatures were about ten degrees above normal, it was sunny, and we saw loads of beautiful spring wildflowers along the roadways in both states. Texas had its iconic bluebonnets, orange Indian paintbrush, tall white flowers, and delicate pink, low-growing flowers like ones I saw at Brazos Bend. Louisiana had lots of blue and yellow flowers in bloom. As far south as we stayed that day, there were many new green leaves on the trees and the grass was bright green. The southeastern part of Texas doesn't look like it's in as bad of a drought as the rest of that state, and Louisiana appears to be getting plenty of rain. "Lush" is a good description of the route that day. 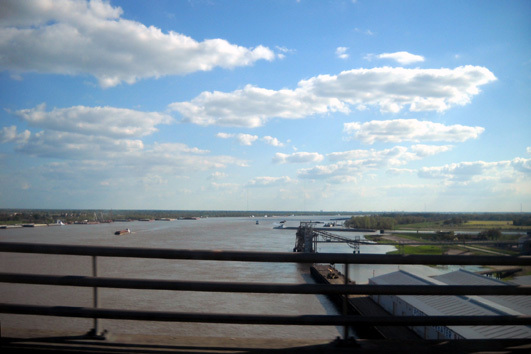 One reason I like traveling this route is the scenic section through Henderson Swamp between Lafayette and Baton Rouge, LA. Too bad that's after some of the roughest miles on I-10. While we were in Vidor, TX Jim wanted to get his lunch at Whataburger. We pulled the Cameo into the back of what looked like a large parking lot nearby. Unfortunately, it wasn't as easy to get back out as it was to get in, mainly because of all the vehicles that were parked there. 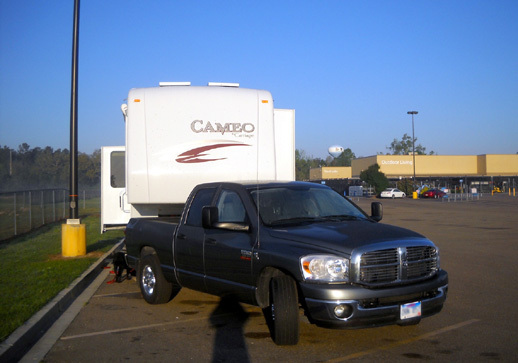 What happened next was one of our rig-pulling nightmares -- Jim turned too tightly to get back out to the street and smacked the front cap of the camper against the window and post of the truck behind his seat. The glass shattered, scaring the crap out of both of us and Cody, who was closest! 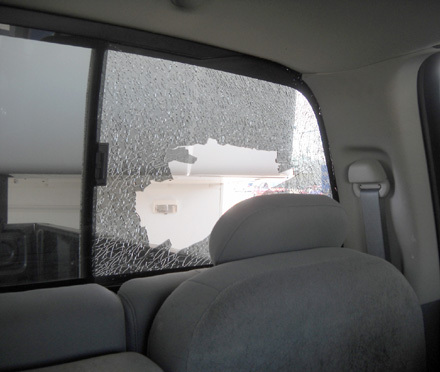 Because it was safety glass it mostly cracked and remained in place. What flew out fell into the bed of the truck, not on Cody in the back seat. The dented post on the truck cab nearly matched the one we previously dented on the other side of the window last fall! It didn't look so bad and wasn't damaged down to bare metal so we just left it as is. This time we knew we'd have to get the truck fixed. The only good news is that there was no damage to the Cameo and we didn't hit any other vehicles. Jim felt terrible but it was as much my fault for not watching as closely as I should have while he was turning. We both got distracted because we didn't want to hit any of the cars and we took our eyes off that corner of the truck. This was exactly what we feared might happen "some day" when we got a short-bed truck instead of a long-bed one like we had before. Dang! Cursing and moaning, we drove a little further through town until we found a city park where we could re-group. Jim and Cody took a short walk. I started scrounging for cardboard and duct tape, which seemed to me like an expeditious, albeit temporary, solution. When Jim returned we debated between trying to get the window fixed that day (a Sunday -- ya think? ), trying to find a glass shop the next day somewhere farther along our route in a bigger town, or covering the hole and broken glass well enough to get us to Roanoke and getting it repaired there. We decided on the latter solution. It didn't seem like we had any more road noise the rest of the way to Virginia and since we can't see out that window anyway, with the 5th-wheel back there, we hardly noticed it. 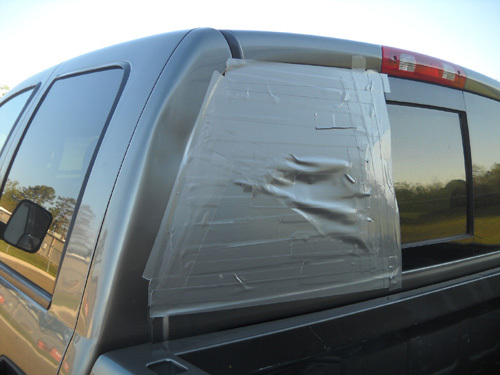 It's amazing what you can do with duct tape! Just ask any ultra runner or handy(wo)man. One of the funniest threads on the internet ultra running list over the years has been about all the ways runners can use duct tape to their advantage. I also saw a great quote on the Carriage, Inc. RV internet list re: the essentials of any tool kit: "If it moves and it shouldn't . . . use duct tape. If it doesn't move and it should . . . use WD40." Our duct tape "fix" has weathered some pretty heavy rain in Roanoke while we try to figure out how much of a repair to do (just the window? one or both posts? the whole mess? ), where to get the work done (we've gotten quotes from two reputable auto body repair shops and one glass shop in Roanoke), and whether to pay for it outright or make an insurance claim. Unfortunately, we have a rather high deductible of $500 for each occurrence. It'd be pretty obvious to a claims adjuster that our damage occurred during two incidents, not one. That'd be $1,000 out of pocket for the whole repair and the insurance company would surely raise our rates to compensate for the remainder of the cost, or more. The repair quotes have ranged from about $300 for only a fixed-glass window (we had an electrical sliding window) to about $2,000 to do the whole job with another electrical sliding window. We can save about $200 if we get a manual sliding glass window. Decisions, decisions. We have about a month to figure it out and get the work done before we leave on our summer trip. There is plenty of room at the far (garden center) end of the store for RVs and that location is out of truck traffic making deliveries overnight. The store was very busy when we went inside at 6:30 PM. It's also very, very big, even by Walmart standards. You can see that the parking lot near us is virtually empty, however. The store is about 1/2 mile from the freeway so we didn't hear much traffic noise at night. Cody had some cool grass to lie in right outside our door. We had good Verizon phone and MiFi internet connections but poor TV reception (we don't have satellite). Continued on page two . . .